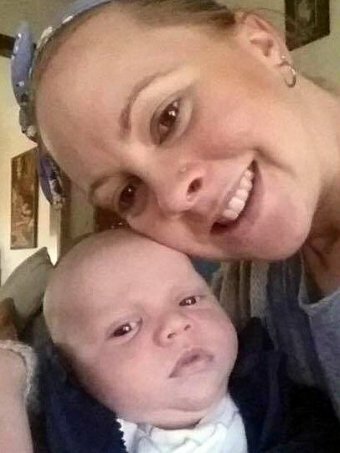 Photo: Emma O’Connor, who was hit by a car in Alice Springs, pictured with her son Kaiden. A secret listening device planted in a caravan provided the evidence that led to the arrest of an Alice Springs couple over a hit-and-run, a court has heard. Brett Alan Dredge, 52, and his wife Narelle Dredge, 51, were arrested earlier this month in relation to the October 21 crash that left Emma O’Connor, 25, in a coma with serious injuries. They have both been charged with hit-run causing serious harm, attempting to pervert the course of justice and making a false statement. At a bail hearing for Brett Dredge, a police prosecutor said officers installed a listening device in the couple’s caravan and had monitored conversations between the defendants, which provided evidence for them to be charged. The prosecution said it opposed bail for Brett Dredge based on what police said they overheard during the discussions between the two. However, the magistrate granted it, saying conditions were sufficiently strict. Narelle Dredge was granted bail after her arrest. The incident occurred two days after Ms O’Connor got her motorcycle driver’s licence, and she was being taught how to take off from the side of the road by her husband, Jesse O’Connor. Mr O’Connor jumped clear of the incident, but his wife was flung into the air. Her back and pelvis were broken, and her skull fractured in the crash. She is now awake and in a stable condition in the Royal Adelaide Hospital.